Pay-Per-Click (PPC) or Paid Search is the core of many of the best web marketing strategies. It is well established and getting more sophisticated all the time. There are more options than just Google. And within Google there's more than just Paid Search - think Display ads; think Mobiles. Affiniti know the dynamics so let us help you optimise your PPC. With 92% of people using search regularly it remains, with email, at the top of the tree for internet use. 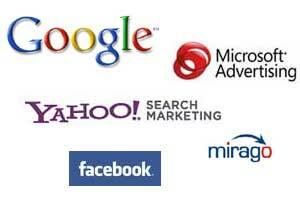 As you'll know paid search allow you to place adverts on the search results pages of search engines, like Google. Most importantly it means you show relevant adverts to people searching for your product or service when they are in the research phase of the buying cycle - i.e. they know they want your type of product/service and are now looking for the provider. It's your chance to win their custom. It's called Paid Search or Pay Per Click because you bid an amount to have your advert shown in the search results. You only pay if the customer clicks on your advert. They are then brought to your website. This market has grown exponentially in the last decade. The UK advertising spend on paid search is now around £4bn with most of the expenditure by small and medium sized businesses. Why is it small and medium sized businesses? Because paid search allows them to compete against the big boys - it gives them a chance to leapfrog the competition. You've probably been thinking "Google", but they are not the only paid search offering. They should form the core of an online marketing strategy but there are other PPC-based advertising providers that can offer very strong returns too. Each provider has it's own strengths and you should use as many as possible (so long as it is profitable) to reach your target audience - and that's where planning & buying come in. We can guide you as to which paid search networks are likely to be right for your business. And then we can experiment and help find which will work over the long term. Another reason why PPC Paid Search has taken off is because it is completely transparent - everything is measurable. It's therefore possible to turn off what is not working and invest further behind what is. Affiniti's PPC Credentials - Why USe Us for PPC Management? We've been very active in the paid search market since 2004 - both on our own account (Lead Generation) and for our clients. We've evolved as paid search providers have evolved. We know their PPC services inside out and perhaps most importantly we know how to extract the best value from their PPC services. We keep very close to the main search providers, especially Google, to ensure we keep up with developments and to ensure our clients benefit from innovations as soon as they become available. Because we spend our own money on our own websites we are constantly reminded about how we should manage our clients and their budgets! We'll work closely with you and we'd love to demonstrate to you that paid search can work well even if you think your business is in a PPC sector that has astronomical PPC bids. There are always opportunities. If you're already using PPC we'd love to help you cut out the waste and invest behind the keywords that will work for you long term. Contact us to discuss your specific requirements. Improve your natural search result positions for visibility & credibility. For a coherent online media strategy that achieves business objectives. Select the most appropriate online media for your target audience. Display/banner advertising, Social Media, Blogging and Online PR.